An alternative to bandages or elastic compression garments. Can be used to reduce edema. To reduce edema instead of bandages or if Lymphedema Therapy is not available. Elastic compression stockings can be difficult to put on. 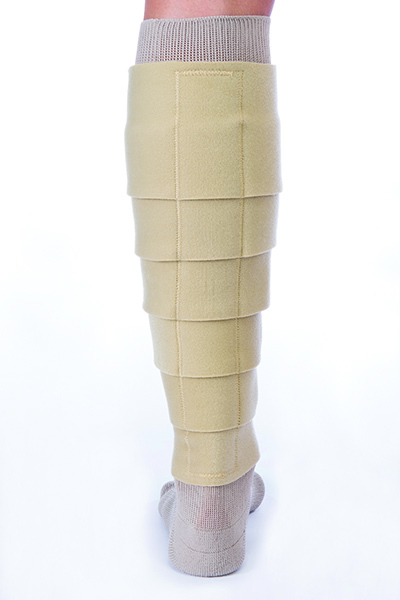 The Farrow Wrap can serve as an option for compression stockings for those that have fragile skin, painful shoulders or a weak grip. We sometimes suggest this if a patient is not able to participate in the full therapy program due to long driving distance to the clinic or high co-pay costs. We do recommend that you get training in the proper application. The Farrow wrap comes with a hybrid sock liner. It provides compression for the foot and ankle. It can be difficult to put on but not as hard as knee-high compression garments. Many of our patients can put them on using rubber gloves or a regular sock aid. 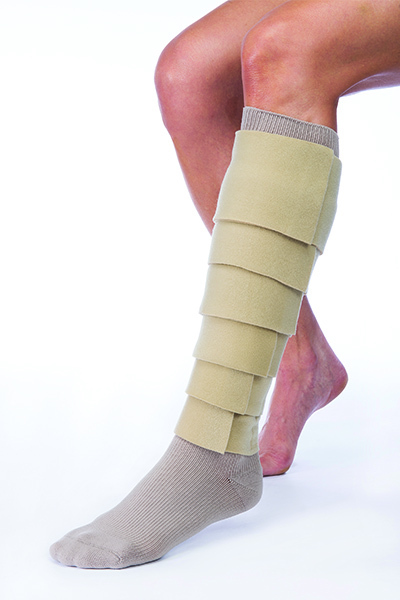 Do not use the wrap without compression on your foot and ankle as it can cause increased swelling in the foot. Adjustable in size. The garment can change with the leg. Can be used to reduce edema as self-treatment. May reduce the need for therapy. Requires no strenuous pulling to get it on. Gentle on the skin as there is no shearing or pulling. 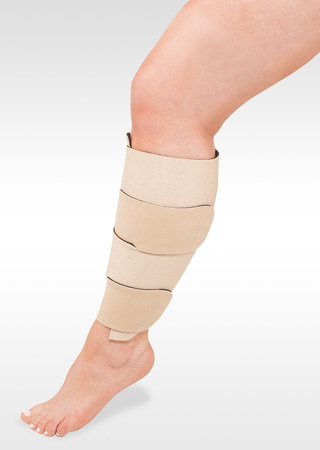 Overlapping straps eliminates the risk for exposed areas where edema can increase. Not as effective as short stretch compression bandages applied by a Lymphedema Therapist. Requires dexterity to be applied independently. Requires that you can reach to your ankle. It has to be applied correctly for even pressure. Otherwise, it can cause blistering or discomfort. The compression sock that we recommend to most of our clients. Non-elastic compression alternative to elastic arm sleeves or bandages. Can be used to reduce edema when therapy is not available.